David R.P. Almeida, MD, MBA, PhD, is a vitreoretinal surgeon at VitreoRetinal Surgery, PA, in Minneapolis, Minn.
1. How do you prepare for an unusual surgery case? Planning is key. I prepare by deciphering what factors make the case challenging or unique and then plan to address these factors with the techniques that I know will produce the best outcomes. Intraoperatively, I stick to my plan, realizing that the time for action has arrived. Tough cases sometimes haunt surgeons, but I have come to appreciate that the last case cannot be done over and all that matters now is the next case. 2. Tell us how your PhD in pharmaceutical sciences gives you a different perspective on challenges in medical retina. I approach many vitreoretinal disease states from a therapeutics design vantage point. This helps me to target the endpoint I am trying to achieve. Currently, in the sphere of medical retina, I believe we are limited in our therapeutics. 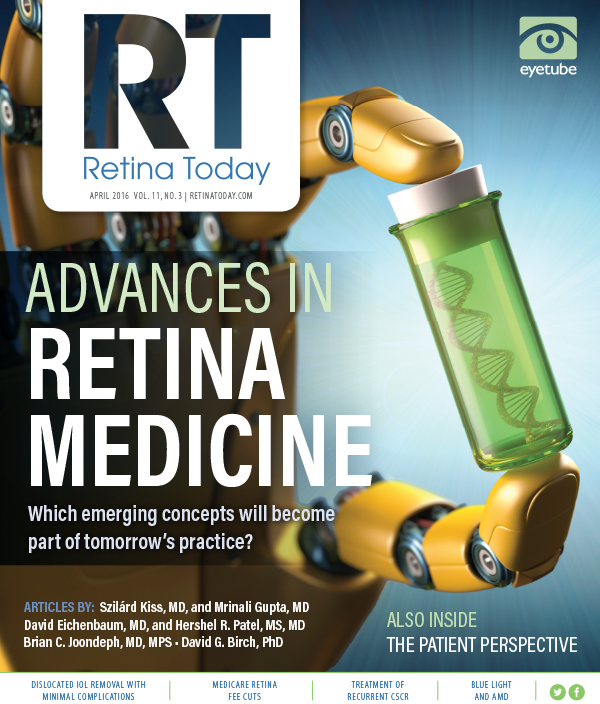 I agree that we have more options than ever, but I feel that a lot of medical retina diseases have myriad relevant targets that will benefit from multiple modality treatment. 3. Does your MBA have applications in private practice, or is it more useful in a complex hospital system? My MBA training allowed me to discover management guru Peter Drucker, whose model for effective decision-making includes asking questions such as: What is this all about? What is pertinent here? And, what is the key to the situation? I use this schematic every day, and I am thankful for his work on management by objectives. Specifically, I think my MBA is more applicable to private practice and other corporate models that value efficiency. I wish complex hospital systems and academic centers emphasized efficiency to a greater extent. 4. How do you begin a conversation about disease management with a diabetic patient who presents with diabetic macular edema? I am a big believer in multiple modality treatment and synergy between different mechanisms of action. The well-studied pharmacodynamics concept of combination drug mechanisms of action in oncology and chemotherapy literature shows that certain synergistic drug combinations may act as a more potent version of a single drug. Consequently, I usually describe the options available (eg, anti-VEGF agents, corticosteroids, focal laser) and illustrate how I combine them over the course of therapy. I always stress the need for optimized systemic factors as well. 5. Your children have very cool names: Maximus, Leonardo, and Paloma. Tell us one interesting characteristic about each child.